I'm moving all the sources of Pepper&Carrot from GitHub to the open and friendly Framagit; Gitlab hosted by Framasoft (you can login to Framagit with your Github account). The repo on GitHub will be removed soon. Thanks again to GitHub for all the fun and hosting. Comment here to let me know your new @name on Framagit and I'll give you permission to clone and push. The website's php/xml code powered by PluXML and its theme and plugins are now finally open and have their own public repository. 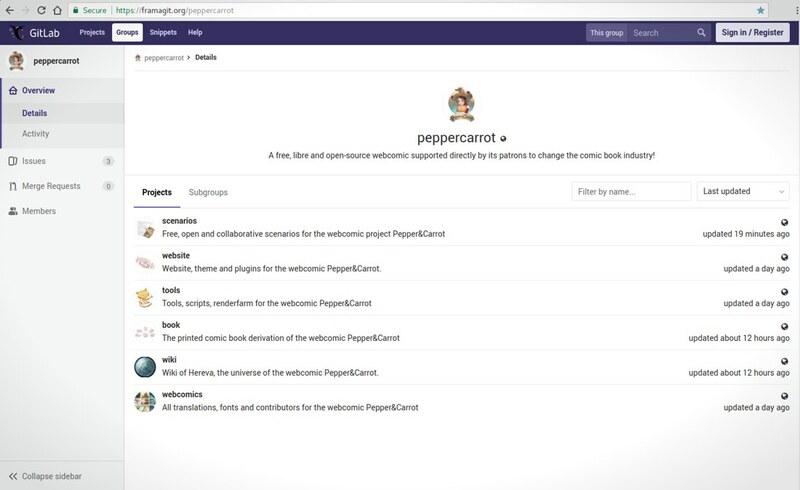 Pepper&Carrot moved to a group with multiple admin, centralized access permissions, pull request and bug tracker. I no longer own all the repositories under my personal account. This will help maintenance but also reduce the key person risk. I merged our 25 translation Git repositories into a single one. It's now easier to manage. We still have all our revisions since project creation. The credits are also now centralized to a single CONTRIBUTORS.md at the root. We had plenty of svg named like that: Pepper-and-Carrot_by-David-Revoy_E##P##.svg ; they are now E##P##.svg . Our renderfarm now uses Inkscape 0.92.2 by default. It breaks small things here and there (punctuation in right-to-left languages) but I'm sure it can be fixed. (If a contributor mastering Arabic is around this is a call to fix our 'ar' folders). License: CC-BY David Revoy, www.davidrevoy.com, 10 november 2017 . David, you are truly an artist in many ways. You set up a great website, you help bugfixing the FOSS and you have made nice tutorials. You are also able to draw a comics that cheers me up. Thank you. You know you can keep the Github automaticaly updated from the new Gitlab repository? Just setup a simple CI script and it will push your changes automatically. EE versions of Gitlab have some tool to do it even easier. Thank you Pepca for the information. I didn't know and I studied yesterday evening a bit the situation. Yes, it's possible to sync things; Gitlab has mode to push or pull. But, it is also a problem for privacy: email of our contributors, commit names and our habit (hour we push, productivity, IP from where we push) are still available to a private entity like Github who can use it the way they want. I decided I'll keep a single repository ; Deevad/peppercarrot , and on it a single README.md with invitation and documentation to adapt to our Framagit page. This way, Github user who wants to use the search engine for a webcomic or Pepper&Carrot will still find the way to our privacy friendly new home. Nice to see some changes, especially regarding a more organized workflow. I really support your choice to merge all repos into one. Thanks for the update and keeping up this awesome project. Added! Nice to see you around! Our group has now 18 members ! Salut David, Love coding and work stories. ¡Merci for tell about Framagit too! @Navi wait translate next episode. Congratulations on your move to Framagit (Gitlab)! Hi there Deevad! Must have been a tremendous workload moving all the repositories from GitHub to Framagit. I made a new account on Framagit. My username is @aslanzm, ready to translate episode 24 into Persian. Any instructions on how to fork and push translations? Is Framagit just like GitHub? Thanks in advance. Hey! Yes, it was a big big work ! Gitlab behaves well; we had no problem so far. I added you to get permission of developer. So, feel free to just clone the repo ( https://framagit.org/peppercarrot/webcomics ) , work your langs in a branch, and merge it in master when ready. Gitlab also give you the possibilty to fork under your profile; work there; and send later "merge request" (instead of "pull request" as on Github). So exept one or two words and a slightly different UI you'll not be lost. So far, I love it. Let me know if you need more info! Thanks for the super fast reply and the useful info! I'll let you know if I face any problems. Thanks again. Hi there again Deevad. I've translated the episode 24 into Farsi, and all that's left is pushing the files into the repository I've forked from https://framagit.org/peppercarrot/webcomics. The question is can't you upload multiple files via the web interface? In this case, I should upload the files one by one (which makes a commit for every upload), and the request a merge. Is there a simpler way of pushing files that I'm not aware of? mm... I don't know a lot how to manage things via the web interface. I use git with the command line on Linux. If you can't upload your work, just open an issue https://framagit.org/peppercarrot/webcomics and attach a zip with your folders. I'll merge them manually. I'll do so. Sorry for the trouble. framagit uses the gitlab software, and indeed, gitlab makes a new commit for each newly uploaded file. If some time you'd like to learn how to use git on your computer (there are graphical programs for doing so, you do not need to be able to use the command line if you don't want to), you'll discover that it's not so hard.